NOTE: Page is still under construction. Thridi Dala Montross is the daughter of Collison Montross and Travis Dala, but was unaware of this until her fall to the darkside. As a fetus, she was grown much like a clone and given similar additives such as growth acceleration as part of scientific experiments on the Polis Massa Medical and Research Facility. Her early memories were on the moon Rori, struggling to survive in the harsh jungles with other orphan children who escaped their fate of being terminated for being test failures. As fate would have it, Thridi was discovered by Master Tabris Longuine and Jedi Knight Celia Zatel on the moon, while on a mission, and introduced her to the Jedi Order. She became the apprentice of Celia Zatel, and trained under the Grand Master's watchful eye. 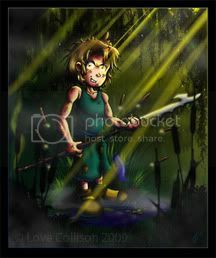 After learning of her origins and of her family history with the help of her Master Celia Zatel, Thridi sought to avenge her parents death, mostly in regards to her mother. Shortly after she have became a self proclaimed Sith Lord, after defeating Darth MorMacel, Thridi now known as Darth Imogen, continued to seek her own justice on the galaxy. Thridi was found on Rori, in the thick jungle living on the out skirts of the neighboring city. She has no memory on how she got there or when, all she could remember were here friends. Her best friend was Diggory who stuck up for her when the other boys would pick on her for her "magic" when hunting or fishing. Sadly during their routine fishing trip, they ran into the local rancor or better known as "The Biggon" and were slaughtered in front of Thridi at their camp sight. Using her "magic" just as she did to the fish and other beast, she tricked the rancor and defeated the creature by running up it's back and stabbing it in the back he the neck. Wasting no time, she fled into the city sticking to she shadows in fear of the slavers and other carnivorous humanoids, until she was saved by Celia and the "scary looking man." After being rescued from potential enslavement or worse, Master Tabris Longuine saw fit to appoint Thridi to his former apprentice Celia Zatel. This was only after careful consideration and a few notable features and talents the young Thridi possessed and flaunted at the time. Not to mention spending a great deal of time with a few protocol droids on Naboo. This was where the young girl obtained her fear and dislike for droids, after being partially drowned several times in the name of bath time. From here on out, when ever Thridi had to interact with artificial intelligence, she cringed or lashed out viciously in retaliation to her past experience with faulty droids on Naboo. As time progressed, so did the bond between the young Thridi and her master Celia. Even despite the fact that a vast majority of the time, Thridi and Celia spend a great deal of time apart due to Celia's prior engagements and assignments given to her by the Jedi Council. It was quite apparent that with each long absence from Thridi's life, she seemed to have grown a significant amount. Not just in her knowledge of the force from frequent studies in the Great Library at the Jedi temple on Coruscant, but physically due to an unknown source at the time of her apprenticeship. Aside from this, Thridi was quite the misfit of the Padawans and even Younglings during her time at the Jedi Temple. More often than not, the Librarian's, who were in charge of Padawan Thridi in Celia's absence, saw it fit to punish Thridi for her mischievous acts of chaotic and disorderly conduct reported by several Jedi. In spite of these situations, Thridi still managed to find time to study, mostly because she was 'sentenced' to cleaning and organizing various data-pads in the Great Library. Usually she would only take interest in subjects pertaining to combat, whether it was lightsaber combat or strategic positioning in war. The subject interested her a great deal, but sometimes she did study on other philosophical theories and histories from time to time. When she wasn't being punished for her misbehavior, Thridi still managed to find a way to escape from the protection of the Temples walls. Either by stealing various vehicles owned by the Jedi Order or stowing away on public transport, or merely sneaking out on foot to a local cantina on the dodgy parts of the vast city. As Thridi was like her mother in so many ways. The over confident attitude and cleaver wit, she was quite a handful as far as children go. Not to mention anything but girly- partly because of her rearing with orphaned boys on Rori with no real feminine role model during the time. Another unique trait was that she grew and matured quicker than any normal human child. This was due to the growth enhancements given to her while she was being grown on Polis Massa. She is a very emotional person, and could never control them as a Jedi. It wasn't until she embraced the Darkside as Darth Imogen did she learn to control them and use the to her full advantage. She was also a very instinctive person. She often relied on her primal instincts in battles, most notably with her brutal sparring match with Commander Marius on Dxun and in her battle with Tabris Longuine and his Padawan Drake Rylan on Dantooine. Her thirst for physical strength rivaled that of her thirst for Sith Force Powers. Unarmed she was still very capable to hold her own in a battle, and made her very dangerous. Despite all of this, she was far from happy- and often went in deep states of depression where she turned to various different species, chemicals, and stimulants to ease her pain and deal with her problems in a pathetic manner. It was often behind closed doors, but the side effects were something she couldn't hide from [[celia-zatel | Celia Zatel]]] and often felt Imogen drift from the force- losing her connection. 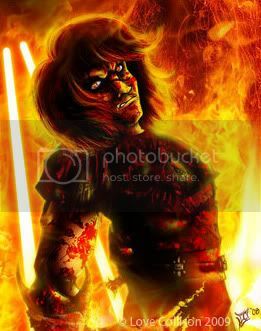 And with all of this there was always conflict between her heart and her savage lust for revenge- but she truly believed she could and will never be redeemed to the lightside for personal and moral beliefs. Although, she was very loyal to Celia, despite them growing distance from each other as Sith, Imogen would still follow her anywhere and risk her own life for that of her dearest friend's. On a side note, Thridi had a strong dislike for droids, especially protocol-droids due to traumatizing events on Naboo as a youngling. They went rogue and used considerable force to bathe her, nearly drowning her. From then on she never trusted the likes of them. As a Padawan learner, Thridi learned a great deal from her studies the Jedi Temple on Coruscant. The Force techniques she learned were the usual abilities taught to Younglings and Padawans alike: Control and Sense. Altering techniques she aquired were from her Master Celia Zatel. Although unlike normal Padawans, she was introduced to dark side powers on a regular basis. The Sith Archon, Lord Ensis, introduced her to Sith alchemy, while the Grand Master of the Jedi Order applied Force Lightning upon her. When Thridi became a Sith Lord, she studied from her Mother's holocron uncovering secrets regarding the Sith as well as studying various information that was available at Ensis's residence. She frequently uses Dark Rage and has become very proficient with it, often using it when in a pinch. Darth Imogen has also been known to use on occasions, Sith Lightning, Force Scream, and Force Wound all at varying degrees. In regards to Lightsaber Combat Forms, Thridi studied about the basics of each of the seven, but favored that of III, V, and VII. She preferred the reverse grip of the lightsaber hilt, despite it being frown upon when she was a Padawan. She felt as though it was an advantage since it's rare to encounter one who applied it and would probably throw future opponents off guard because of it's unorthodox style. As a Sith she discovered her mother's saber and began battling with dual sabers. Aside from Jedi and Sith teachings, Thridi was a decent pilot, but was far from being as talented and experienced like her mother. But like her mother, Thridi had a need for speed and the desire to fix her vehicles on her own. Thridi's best talent was that of computer programming. She was the best at what she did, and was known for hacking into the Jedi Master's personal terminals and retrieving forbidden files. The only official Council member to find out about her talent and exploit it was Jedi Master Ben Massing, who later personally asked for her help and knowledge to supervise and develop a defensive system over looking the planet Coruscant.